This review first appeared in the December 2009 issue of hi-end hifi magazine High Fidelity of Poland. 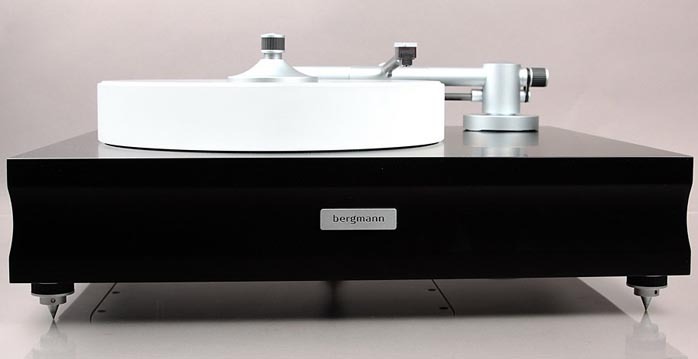 You can also read this review of the Bergmann Audio Sindre in its original Polish version. We publish its English translation in a mutual syndication arrangement with publisher Wojciech Pacula. As is customary for our own reviews, the writer's signature at review's end shows an e-mail address should you have questions or wish to send feedback. All images contained in this review are the property of High Fidelity or Bergmann Audio - Ed. The Danish firm Bergmann Audio is a kind of shared discovery between its first Polish distributor SoundClub and myself – or perhaps parallel rather than shared. When I contacted the company’s founder and owner Johnny Bergmann Rasmussen, he gladly agreed to a review but asked for two months lead time to have a unit return from its American review tour. When he finally contacted me, he had already made a deal with a Polish distributor and the Sindre deck would be presented during this year's Audio Show. The distributor was SoundClub. Maybe it's just me but I get the impression that this company acts as a vacuum cleaner 'sucking up' all the most interesting and often best products of their class on the market. This still newer firm already has assembled a product portfolio which reviewers dream about while counting the money in their bank accounts. That's what happened to me. I hopelessly dreamed of Air Tight's PC-1 cartridge which I must posses one day and … received it together with Bergmann's turntable for review. A dream come true. Still, this writeup will mostly cover the Sindre turntable whose form factor, like the best of Scandinavian devices, is beautiful in its stark simplicity. The purity of lines and simplicity of solutions remind me of Nordic Concept, a company that’s part of the Swedish Statement group of exclusive hifi equipment manufacturers. But the Bergmann looks even better. It is quite big but the absence of fancy frills makes it appear very orderly. The first thing you notice is the apparent lack of motor. Of course there is one, with a classic belt rather than direct drive as you might have expected. The motor sits beneath the plinth and drives not the acrylic platter but instead the heavy sub platter which doesn't sit directly on the bearing but floats on a thin film of air centered by a spindle. 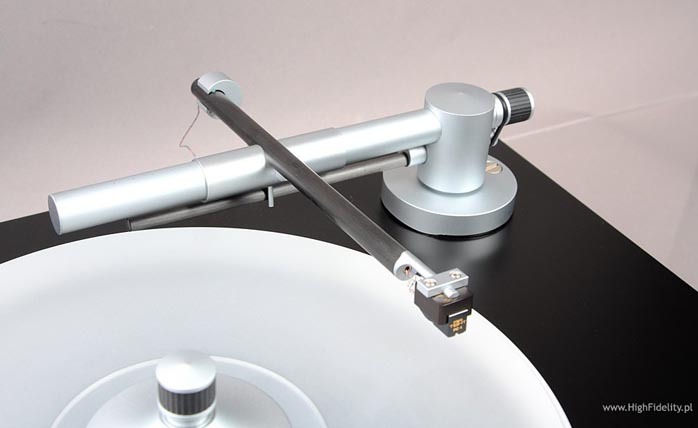 The matching Sindre tone arm is a linear tracking air-bearing device which moves parallel to the record axis. With a common pivotal arm, there are only two instances of zero tracking error and the overall tracking errors result in distortion. Longer tone arms (e.g. 12”) can mitigate some of that but introduce their own problems. During the vinyl cutting process, a cutter diamond inscribes a constant 90° angle from the beginning of the groove to its end. At least theoretically, a linear tracker offers lower mass and significant advantages over pivoted arms. As it turns out, building a high-class linear tone arm is quite an achievement. One finds those mostly in expensive models from Clearaudio, Kuzma and the above-mentioned Nordic Concept. The perennial problem with linear trackers is how they mount. To ensure smooth slides, manufacturers often advocate air bearings. How does that work? A tone arm is mounted on a sleeve that rides on a smaller inner pipe. The distance between them is calculated such that the bigger pipe will freely slide around the smaller one on a thin film when high-pressure air is pumped through several vents in the guide pipe. This moves the tone arm attached to the outer pipe without friction. Theoretically. In practice, issues can arise. In my opinion, the main problem with the Sindre arm is not how it slides atop its air-buffered pipe but how the tone arm lifts. A black O-ring connects the arm tube to a knurled knob that lifts the arm when turned. The leverage appears to be a 1:1 ratio with no hydraulic assist to damp the motion. This requires great care in use. It is neither handy for the operator nor very safe on the cartridge. My second remark concerns VTA. Adjustment is possible but not very user-friendly. You must loosen a set screw before re-tightening it. This can’t be done on the fly. Without calibration markers, one also can’t repeat the same setting for the same record. I appreciate how this would increase the price but the Sindre is already quite costly. A small addition wouldn't significantly impact its overall value but surely benefit user-friendliness.